Trochanteric bursitis is painful inflammation of the trochanteric bursa(e) present near the greater trochanter of the femur. It is popularly also termed as hip bursitis. However, the term trochanteric bursitis has been substituted by greater trochanteric pain syndrome because apart from bursitis, muscle tears, tendinopathy, trigger points, disorders of the iliotibial band or any other problem in the area may cause pain on the lateral aspect of the hip and gets labeled as trochanteric bursitis. Trochanteric bursitis generally occurs in adults and is more common in females. Trochanteric bursitis is more common in broad greater trochanters than the narrow ones. Trochanteric bursitis is also called greater trochanteric bursitis. The greater trochanter is a projection on the outer or lateral aspect of the femur. 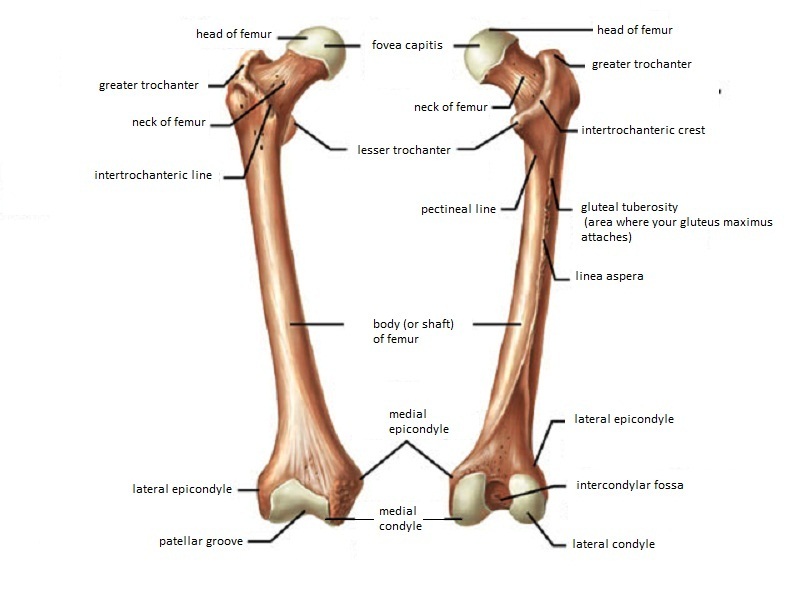 Following diagram of femur would elaborate this. There are four bursae around greater trochanter. Out of this, three burase are constant (two major and one minor). The minor bursa is the gluteus minimus bursa. This bursa lies above and slightly anterior to the proximal superior surface of the greater trochanter. Subgluteus medius and the subgluteus maximus bursae are the major bursae around trochanter and the name signifies the location suggesting the muscle under which the bursa is. The gluteus medius bursa is situated posterior and superior to the proximal edge of the greater trochanter. The subgluteus maximus is lateral or superficial to the greater trochanter. Subgluteus maximus bursa is commonly called trochanteric bursa. This bursa functions as a gliding mechanism for the anterior portion of the gluteus maximus as it passes over the greater trochanter to insert into the iliotibial band. Acute trauma – fall causing contusions over the site, impact injuries. Overuse or repetitive injury during running or walking due to contracture of gluteus medius, iliotibial band or both. Poor posture causing strain on the hips. Obesity – The excess weight places strains on the hip and area around. There is a complaint of acute onset or insidious pain in the region of the greater trochanter. The pain may radiate to lower lateral aspect of the thigh. The pain worsens when the patient lies on the affected side and pain could be severe enough to awaken the patient in the night. Walking, running or sitting cross-legged may exacerbate the symptoms. There might be a history of increased activity recently. There could be a history of impact during trauma. In acute cases, the patient may complain of obvious swelling. On examination, there is a tenderness over greater trochanter and in the vicinity. Swelling may or may not be noticed. Signs of acute trauma may be visible in patients with a history of acute injury. On examination passive external rotation and extreme adduction. Resisted abduction would also reproduce the symptoms. Lab tests are generally not required for diagnosis. However, blood tests may be done for ruling out infection or connective-tissue disease. In trochanteric bursitis, the x-rays are normal. Xrays are beneficial to rule out bony pathologies like a fracture, arthritis, or timorous conditions lesion or calcium deposits. CT would be able to tell better about underlying bony pathology. MRI is able to differentiate degenerative changes, tendon tears, or bursal effusions and considered by many as the investigation of choice. This includes curtailing activities like climbing stairs, getting in and out of chairs. The patient should restrict participation in sports. Sleeping on the affected side hurts and the patient should avoid sleeping on the affected side. This should be done about 3-4 times per day and each time about 15-20 minutes. Corticosteroid injection mixed with local anesthetic would relieve bursal pain and inflammation. Steroid injections are an important part of the treatment and have been reported to reduce the likelihood of chronic pain. Corticosteroid injections are avoided in diabetic people and pregnant females.be used along with corticosteroid injections. NSAIDs reduce inflammation and pain by their anti-inflammatory actions. They can be used to control pain and swelling. Pain can also be controlled by application of topical, sustained-release local anesthetic patches. Extracorporeal shock wave therapy is a noninvasive surgical procedure that uses sound waves to stimulate healing. Any correctable abnormality that could be the cause of bursitis should be evaluated and corrected. If the patient does not respond to treatment, the patient must be evaluated for piriformis syndrome. The athletes may be allowed to return to sports when symptoms have resolved and there is no return of symptoms on practice drills. Most of the patients of trochanteric bursitis do no require surgery. In refractory cases, a longitudinal release of the iliotibial band with the removal of subgluteal bursa may help. Rarely, partial removal of the greater trochanteric process may be done. As bursitis is mostly due to overuse, it is important to modify the activities causing because most cases of bursitis are caused by overuse, the best treatment is prevention. It is important to avoid or modify the activities that cause the problem. Correction of underlying conditions such as leg length differences, posture abnormalities, or poor technique in sports or work must be corrected. Activity level should be build up gradually. Repetitive activities that put stress on the hip should be avoided. All patients should be advised to avoid lying on the affected side, if possible. Running on the banked surface should be avoided. Protective padding is used in athletes in contact sports. Patient of trochanteric bursitis responds well to treatment. Some patients may require repetition of the corticosteroid injection. Persistent pain, reduced mobility and limping may occur as a complication in some patients.